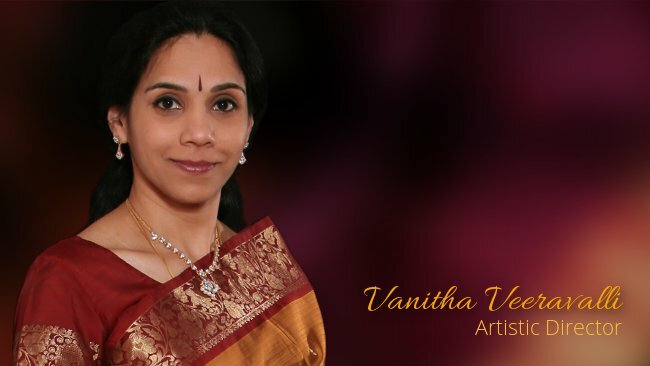 Vanitha Veeravalli is the Founder & Artistic Di­rector of Bharatam Acade­my of Dance Arts, Naper­ville, Illinois, a premier institution dedicated to nurturing and sustaining the ancient art of Bharatanatyam. Vanitha has over three decades of performance and teaching experience, and is a well-known Bharatanatyam artiste in our community. She is recognized for her creativity and classicism in her choreography and productions. Vanitha’s deep-rooted lineage is grounded in Kalakshetra, the venerable dance institution in Chennai, India and further nurtured by illustrious Gurus Kalaimamani Indra Rajan, and Kalaimamani Dr. Saraswati. The energetic Pandanallur style, richly imbibed from her Gurus, blended with her innate eye for grace and nuances, defines Vanitha’s style of dance today. Lineage of Kalakshetra, energetic Pandanallur style, along with innate eye for grace & nuances, defines Vanitha’s style of dance. Vanitha’s performance and dedication to teaching this ancient art of Bharatanatyam have earned her honor grants from Govt. of Tamilnadu, India, as well as the Master Artiste Award from State of Illinois, multiple times. Vanitha was honored as ‘Acharya Kala Vipanchee’, an award for excellence in arts education, by Vipanchee (Chennai, India) a trust established by the renowned artiste Padmavibhushan Dr. M. Balamuralikrishna. As a firm believer in the continuity of this classical tradition, Vanitha strives to kindle in her students the joy of self-expression through the medium of Bharatanatyam.